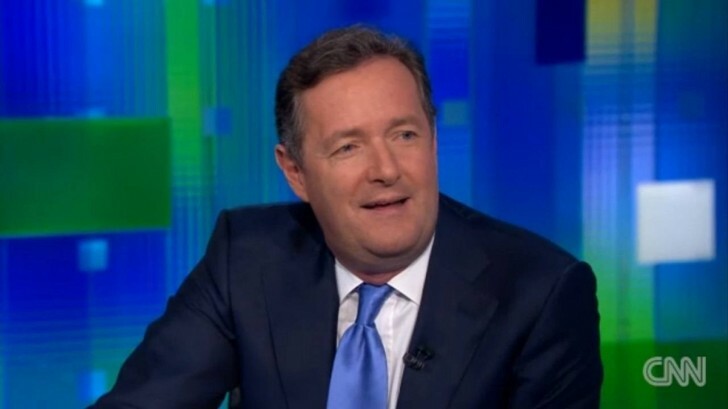 CNN announced today that Piers Morgan would replace Larry King in January 2011. Piers started out as a tabloid newspaper editor, then moved into TV as a presenter, gaining fame in Britain’s Got Talent and America’s Got Talent. He has also authored eight books. We don’t have a time of birth for Piers, but from his Wikipedia page we know he was born on 30 March 1965 in Guildford UK. We’ll have a look at his horoscope set for noon to see what sort of character he is, then check out the transits to see why he landed this plum position. Piers has charismatic and charming Sun conjunct Venus. This aspects seems to be good for the personal appeal needed in the media, Oprah Winfrey and Ted Turner have this aspect. The popularity it brings certainly helps, as shown with another Sun conjunct Venus celebrity, Leonardo DiCaprio. The other major conjunction in the chart is Mars conjunct Uranus which is good for throwing thunderbolts. It will make piers exciting and unpredictable, good at keeping people on edge, not knowing what to expect next. Mars conjunct Uranus is quincunx his Sun, it directly effects his ego, making him eccentric and brash. Both Mars and Uranus are on the fixed star Zosma in constellation Leo. This star is noted for giving an unreasonable, shameless and egotistical nature. Mars anger will be an issue for Piers because of Uranus, but also because of Mars opposite Saturn. This aspects can cause anger to be repressed as frustration, building up to a level where is just has to escape. And with Mars conjunct Uranus, the anger escapes out of nowhere all at once. This can work two ways, either Piers lashes out, or the energy is expressed by other people lashing out at him. He does have a history of getting into fights, both verbal and physical. Mars opposite Saturn can give a mean streak, so Piers does have this hard mean trait, but it is make edgy and exciting from Uranus, and charming from Sun with Venus. The July Solar Eclipse was trine his Neptune, dreams coming true, and Neptune also rules the TV screen and glamour. His Neptune is on the fortunate star Zubeneschamali which gives high ambition, honor, riches, and permanent happiness. The announcement by CNN came just after the New Moon today which fell right on his Pluto, the planet of power and the masses. Pluto is intensity and also evolution, and this New Moon has certainly brought an intense day for Piers, and signaled a new chapter in his career and life. Thanks for that analysis Rob. I had never heard of this guy till yesterday so it’s good to get some feedback. It will definitely be interesting to see you Americans react to him taking this position. Really fascinated to see this chart. Never known quite what to make of Piers Morgan. I had a go at rectifying the chart and I came up with a Leo Ascendant – not sure why, just felt right – it put Sun and Venus up top round the Midheaven. Astonished to see he has a Pisces Moon, and pretty much opposite Mars/Uranus. Ouch. Pisces is a shapeshifter though, and he certainly does that – reinvents himself frequently. Doesn’t like to be pinned down. I love the image of “the little boy masquerading as a man” Rob – perfect description. And the name – Piers is a name you see so rarely. As if his parents named him to stand out. Nothing so common as Peter for this one – they won’t forget our boy! I have already written my comments to CNN. I managed to get through three shows with Mr. Morgan. Anxiety for the guest, anger on my part for Mr. Morgan’s constant interruptions. No thank you. Larry King had the gift of LISTENING to people. Mr. Morgan does not. He seems to think it is all about HIM, which, being an Aries, makes a certain kind of sense. It does not, however, make sense to give him this position. I have switched off. It will be interesting to see how many American toes he will step on! I am Canadian and his know-it-all attitude is insulting to guests and viewers. That’s what I expected with his Sun quincunx Mars Uranus, brash and egotistic. I’m sure he will offend the natives! Nice template! Was it free? It’s funny because when I told my UK friends (I’m a Brit living in the US) that he was going to do the show they all had the most scathing things to say – a “smarmy git” being the nicest. I’ve enjoyed some of his interviews but others have been nauseating as he does his arse kissing i.e Kardashians, Janet Jackson, Paris Hilton – all of whom I had to turn off as they were so boring and he just creeped me out the way he talked to them. He is known as a rather horrible person in the UK for his treatment of various people while working for the newspaper – to the point where he got punched out by one of them. As Brigitte said in a previous post – his habit of interrupting is appalling – I’m surprised CNN haven’t come down on him about it. He really does want to get his opinion in the mix to the detriment of his interviews. He is also really playing on his British lingo using words and phrases he knows his American guests won’t understand. It’s like he’s trying to be cute but the guests seem to be more irritated by it than amused. Will be interesting to see if he lasts! !